I purchased 2 of these shirts. My husband and I like to twin it on occasions and this shirt was a definite twinsie. Its soft and comfortable. I would recommend always. Harley-Davidson® Men's Black Label Series. 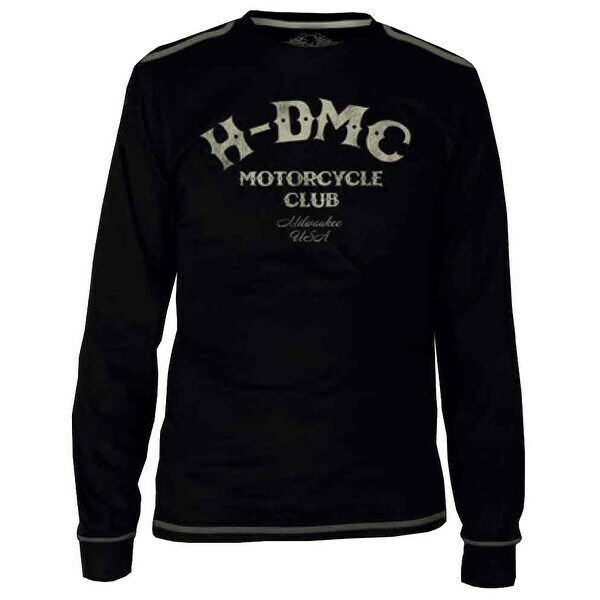 Men's HDMC Tribute Long Sleeve Limited Edition Shirt. Features an awesome distressed H-DMC graphic screen printed on front. Made of super soft 100% cotton. Distressed famous #1 skull logo on back yoke. Made of super soft and comfortable, Superior Quality 100% cotton material. Detailed with cream colored stitching, really ties this amazing shirt together. This is an exceptional quality shirt, great for on and off the bike. Our Black Label Collection is comprised of our signature Limited Edition Black Label line of Harley-Davidson gear for men. Won't be around for long, get yourself one before they are gone! This is such a nice pick from Harley Davidson and my husband couldn't believe that overstock would carry this product and he was amazed on how nice this long sleeve T'shirt . This is one of the most uniquely designed Harley Davidson shirts I own. It comes exactly as advertised. The fit is perfect and I would highly recommend the product to everyone. Love this shirt! Can't wait for my husband to open this on Christmas! Soft and very comfortable - husband loves!